Lots of new BasicGrey kits! Cosmo Cricket Garden Variety ~ Dig In!!! Okay ~ I admit, I don't garden. I hate to get my hands dirty. But I absolutely adore anything with fruits and veggies on it. Dishes, aprons, botanical prints, I am so there! So when the Cosmo Cricket~ GARDEN VARIETY MINI DECK (6x6) arrived in the mail, I flipped and couldn't wait to dig in. When I saw the matching Ready Set Chip! Chipboard Stickers, I knew I had to scrap these pictures of my daughter in her very first bikini! 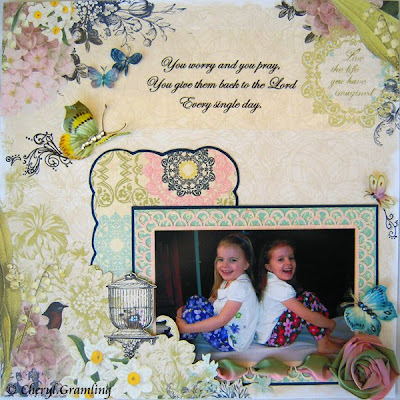 With this layout, I wanted to show you that you can do a great 12 x 12 page with 6x6 papers. 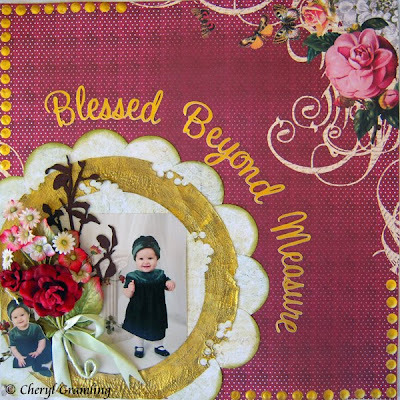 The background for this layout is 12" Bazzill Dotted Swiss Cardstock. I then cut a strip of Bo Bunny Double Dot Cardstock 3 inches wide, used the Fiskars Threading Water border punch and laid the strawberry chipboard sticker on top. 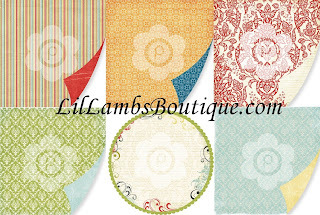 The flowered paper (this pattern is called Bloomers) is cut with a scallop and tucked under the border. I mattted the picture in a bit of red cardstock and added the gingham ribbon and bow. 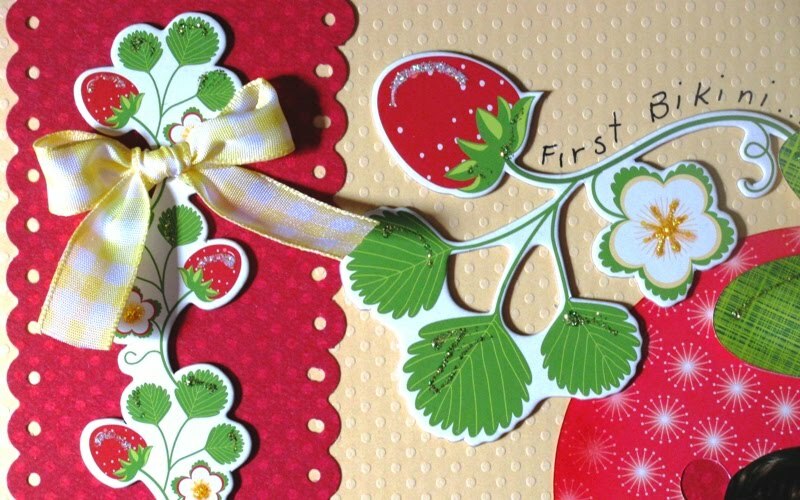 The strawberry is cut at 6" from the Cricut Paisley Cartridge. 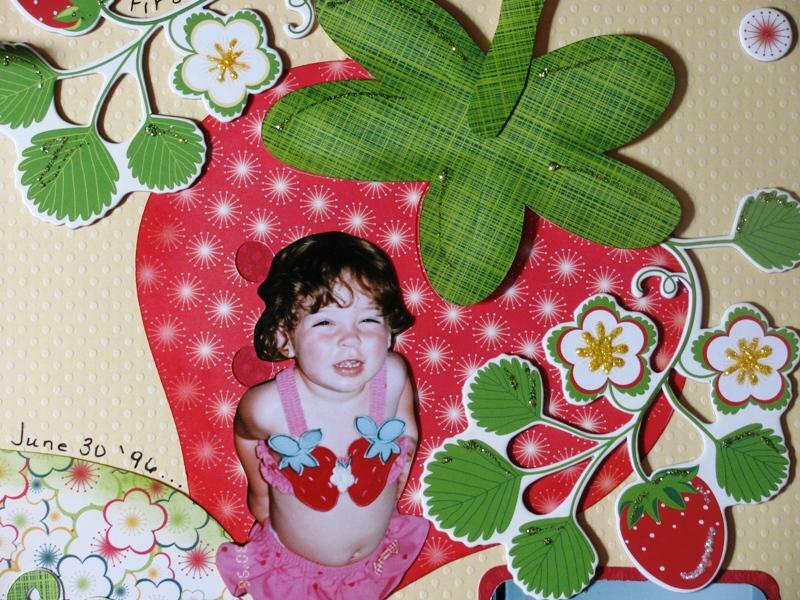 I added the cut out of my daughter and the chipboard strawberry flourishes on either side. 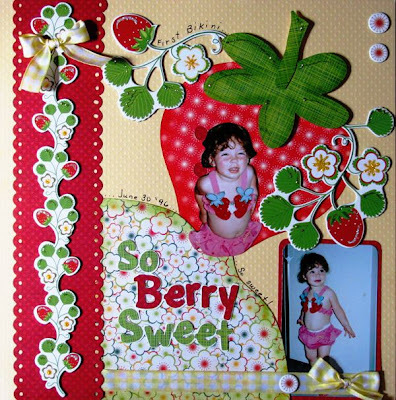 Another gingham bow and Ranger Stickles on all the chipboard pieces add a little zing to this layout! I cut the two tone title with the Pooh Font cartridge, added some journaling and this layout was done! Sometimes, we get so complicated with our layouts, but this beautiful paper stands on its own and calls for simplicity. 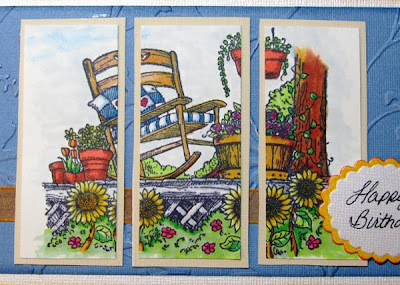 Remember 6x6 pads can be used for so much more than cards! That said, I had to do a super simple card too! This card literally took me 5 miutes to create! 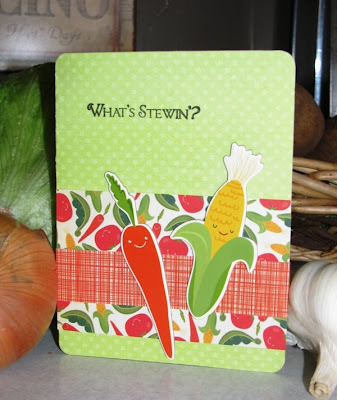 Bo Bunny Double Dot mint (cut at 5.5 x 8.5) , folded in half and corners rounded make a great base for this card, two strips cut at 3 inches and 1 inch, adorable chip board vegetables and a salutation stamped from the Clear Dollar Veggie Stew Stamp set complete this easy card. Gotta go and get back to work in my "paper" garden! 365 Degrees is just plain hot!! Pink Paislee has come up with some beautimous papers in their 365 Degree collection and the 365 Degree Deluxe kit available in the Shoppe just makes your mouth water. I just received some of the new kits in the mail yesterday, started and finished this up today. 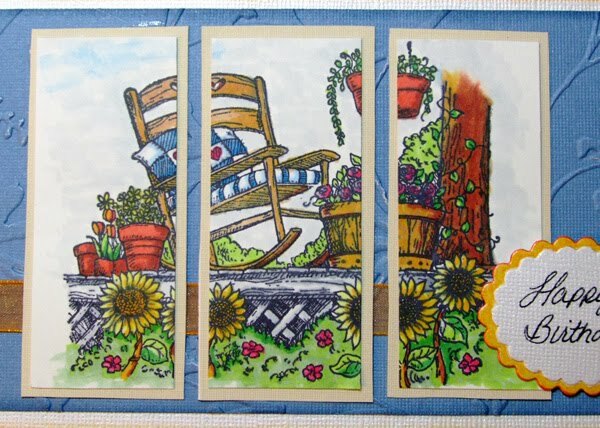 The porch scene (stamp by Inkadinkadoo) is colored with Copic markers that I also found in box yesterday. What a happy mail day!! 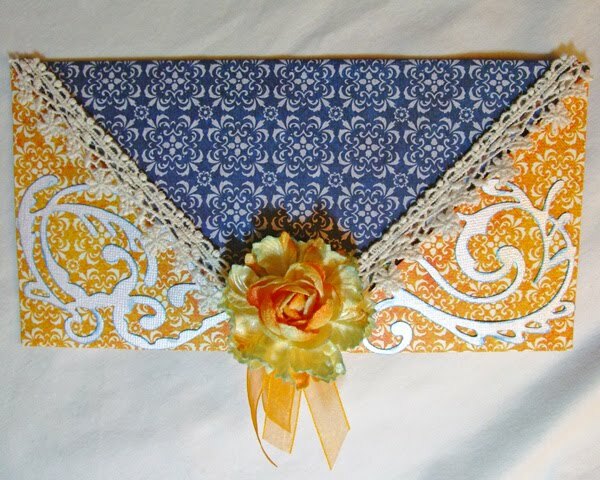 The envelope was made using one sheet of the double sided paper from the kit, along with the lace and Prima blossom. 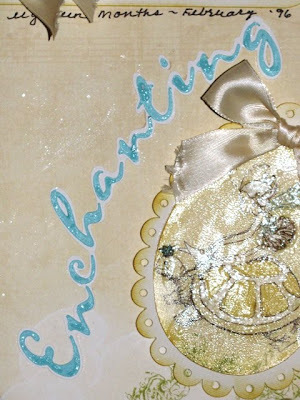 I added shimmer to the flourishes and blossom using Frost Sheer Shimmer Spritz also found in the kit. 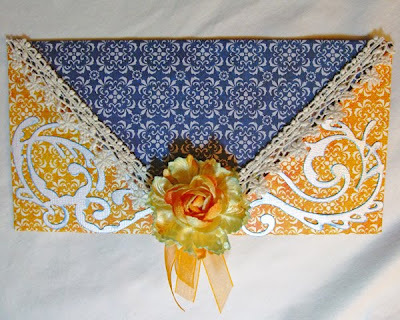 Information on the envelope tutorial can be found here, on my blog. 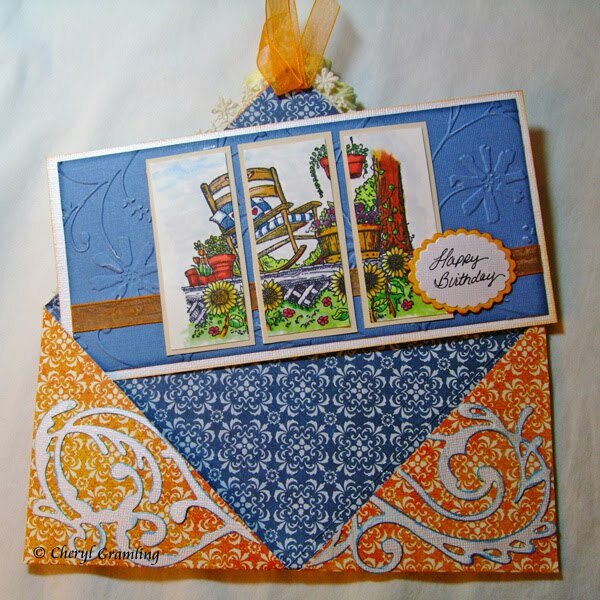 Now Mom-in-Law's card is done and complete. We're doing some spring cleaning! Don't miss the sale! That's good news for you because we've put everything on sale now through April 3rd! Also, if you haven't joined our facebook page...now is the time to do it! 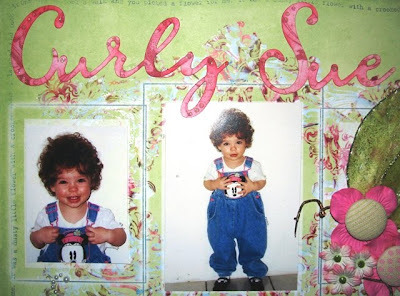 Yesterday, Cheryl asked to see your work using Lil' Lamb's kits and products. We are going to randomly give away prizes and gift certificates to those fans that share their creations with us! So hop on over and let's see them! Pink Paislee scrapbook paper kits are now in stock and ready to ship! They have three beautiful new lines and we will be making deluxe kits out of all of them. They will be listed in the shoppe within the next few days. We also have the long awaited Artisan Elements and will be listing them soon as well! 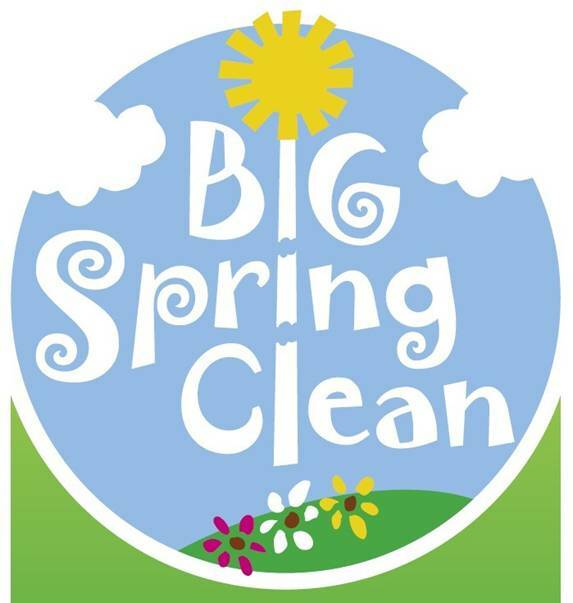 We've also added more products to the Bargain Bin and Clearance sections. They won't last long! Hands down, this has been the most beautiful collection of Prima papers for me. My layout count so far with the Pastiche Deluxe kit is 3 layouts and one card. You were able to see one of my layouts a couple weeks ago, here. So here are 2 more and a card. 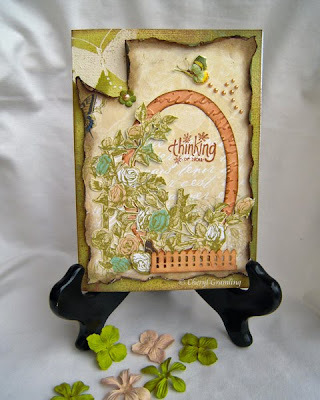 The flowers and dark felt branches are included in this kit. The circle has been distressed several ways. First, by covering it in Crackle Paint, coating with Gold Acrylic Paint and then distressing with a hole punch around the edges. 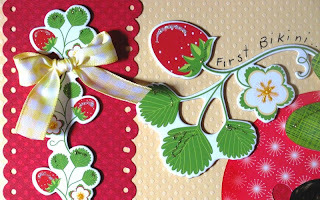 The scalloped border is made using layered cut out circles, with inked edges (Peeled Paint Distress Ink used here). I finished up with Gold painted title letters and then Gold dots around the border edges (using the back of a pencil eraser). This layout is quick and simple. 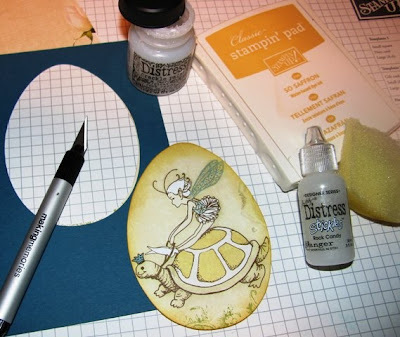 Everything but the rub on butterfly in the journaling spot is from the kit. 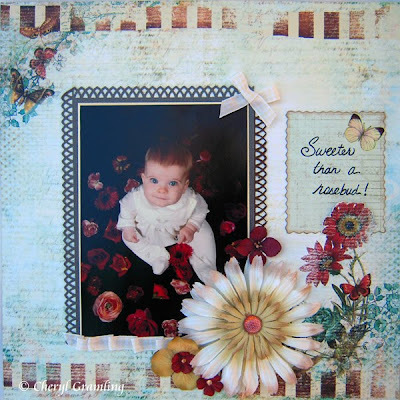 I used the Arch Lattice Martha Stewart border punch for the brown photo mat. The included ribbon made a great bow for the top corner and pleated finishing along the bottom of the mat. 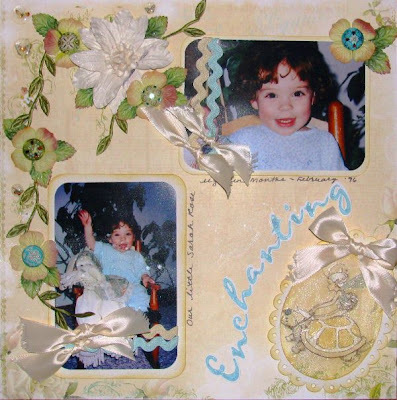 I picked up the Prima packaging material from the embellishments and cut it into a journaling spot with inked edges (Vintage Photo used here). Added layered flowers with Pebbles, a rub on butterfly and it's done. 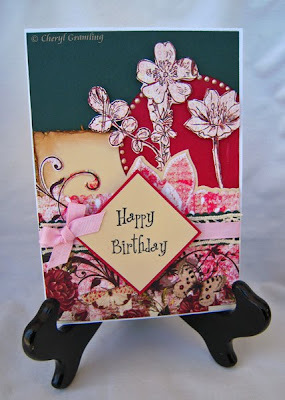 Finally, I used the leftover scraps to create this Birthday Card. 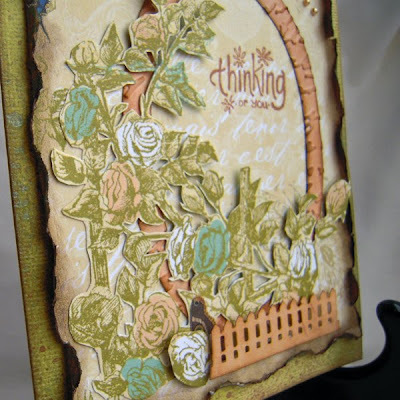 The patterned paper is from the kit and I accented with my solid cardstock stash. 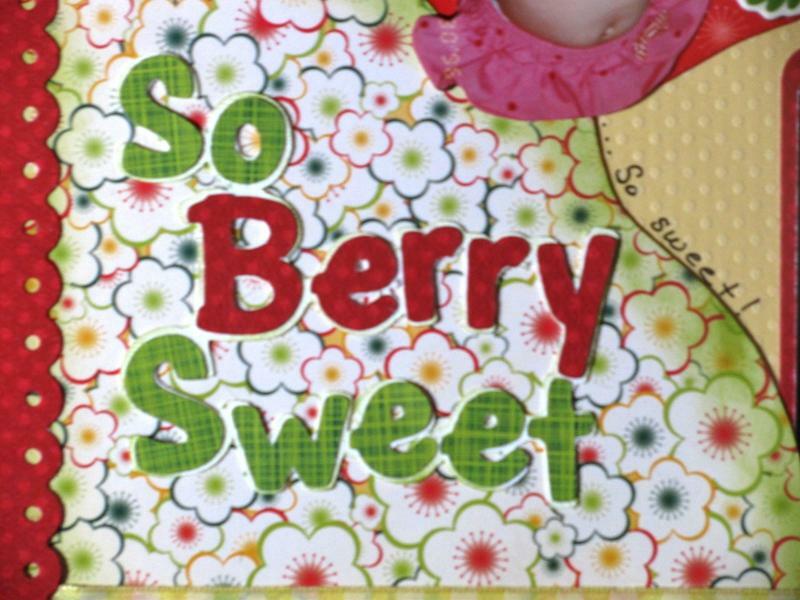 When I saw this paper in the Webster's Pages~ Lullaby Lane~ Deluxe Scrapbook Kit I just fell in love. I adore fairies especially vintage fairies like the one on this page. 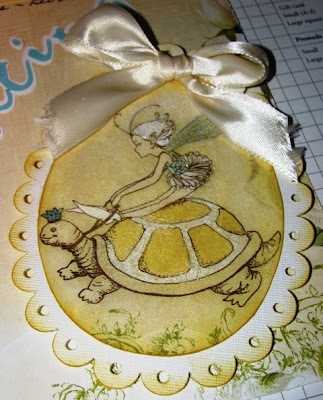 I knew I wanted to really highlight the adorable little fairy and immediately knew that Tim Holtz Distress Crackle Paint was just the thing.The first thing I did was measure the image, then cut out an egg shape from the Easter 2010 cricut cartridge. I centered the image in the negative shape and used my exacto knife to cut out the image. I inked the edges with a little "so saffron" ink and then painted on a liberal amount of Rock Candy Clear crackle paint. 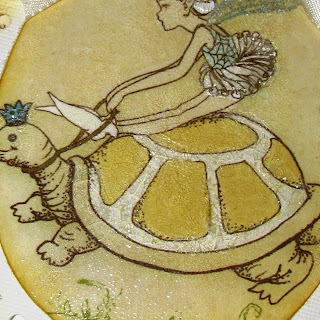 I cut out a scalloped egg (a bit bigger) from the same cartridge, inked the edges and glued the crackled fairy to it. The whole thing was a bit warped, so before my Fabri-tac (my fav adhesive) dried, I ran it through my Cuttlebug (using plates A,B, &C and a extra piece of cardstock for a shim) and it flattened right out! Here's a closeup of the crackle effect. I really love the Tattered Angels Glimmer Mist and use it every chance I get. 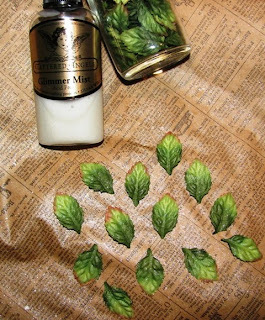 Here I sprayed it on some Prima Leaves (which I ALWAYS have on hand). It gives them an understated shimmer that I just love. The printed vine on this sheet is beautiful but I had to give it more dimension with these beautiful Primas, some satin vine and the shimmery prima leaves. I also put some clear acrylic domes over each of the butter flies to make the come alive! I welded the title base using Gypsy Font and cut it in white, and the top layer (not welded) in some agua paper. To make it pop I used Rock Candy Distress Stickles, the perfect finishing touch! I finished up with my Life's Portrait papers from Websters Pages last night. 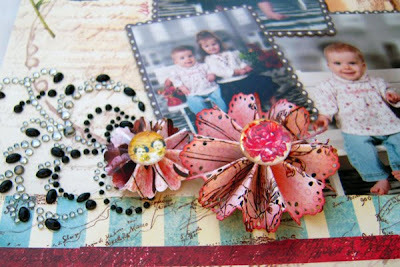 Here are 2 more projects for your inspiration. 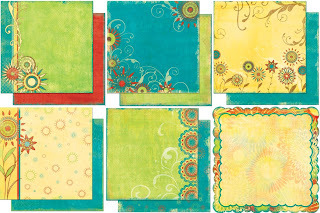 Websters has so many wonderful background starter pages in their collections. That's what I love most about their lines. 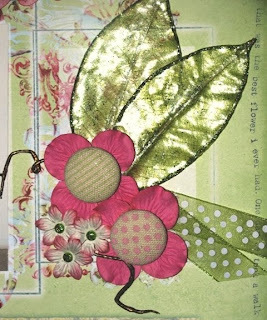 It's very easy to cut out a corner floral pattern with an exacto knife and slip in a photo mat behind, and then pop up the floral cut with some pop dots. 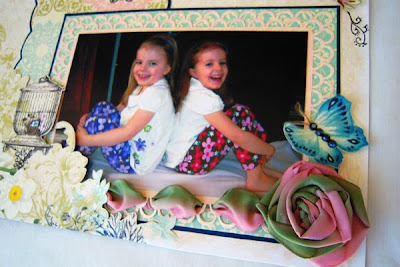 For the photo mat, I used the Double Loop border punch from Martha Stewart. The loops give a nice place to weave ribbon. The ribbon below is a wired ribbon that I twisted into a rose for the end. 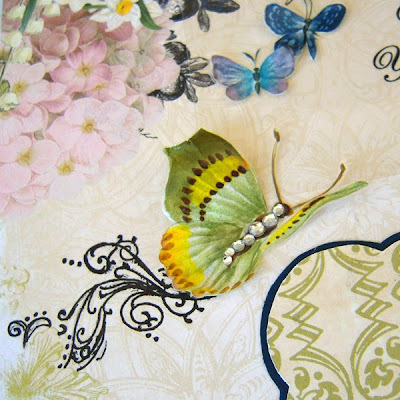 To finish off the piece, rub some rub-on butterflies onto transparency paper, cut out and then heat to curl the wings. Adhere a few crystals for the body, bend the wings up slightly and then glue the underside of the body to the layout. 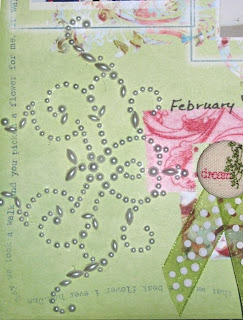 Use a flourish stamp for butterfly trails (Stampers Anonymous stamp used here). 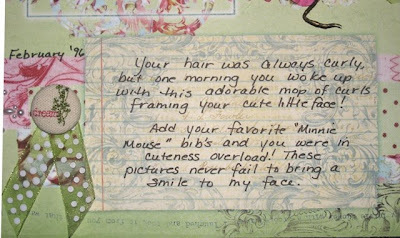 Add your journaling or sentiment and your done. My next project used up some of the leftovers from the Life's Portrait line to make this generic card. A full card tutorial can be found here on my blog. Yay! It's here.... it always brightens my day to open the package from BoBunny! The Flower Child line was just what I needed on this rainy day. The paper kits are listed and I will be putting together a deluxe kit soon with this line. It's perfect for spring and can take you right into summer! 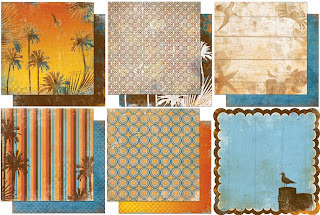 A little bit of "Paradise" .... perfect for those spring break and summer vacation photos. The colors are so rich and even lovelier in person. We have three new album kits! 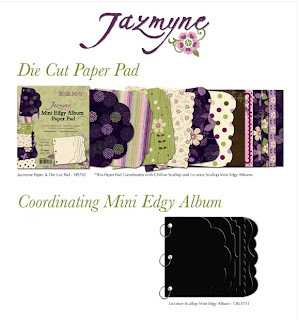 The first one features beautiful new "Jazmyne". 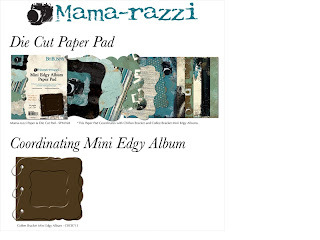 The second features "Mama-razzi" perfect for all of us moms that just can't put that camera down. Both of these kits include the album and the coordinating paper that fits the album perfectly. No more measuring, tracing or cutting. You will have an amazing album completed in record time! And last but absolutely not least is the "Roughin' it" class kit. 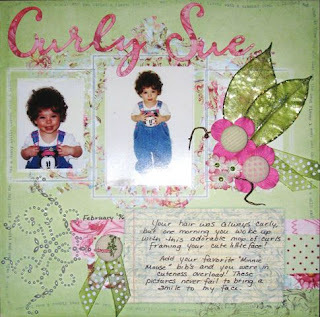 This one includes all of the supplies needed to complete the adorable tent shaped album shown.... and has instructions to go along with it! This would make a perfect gift for a boy scout or girl scout or for your own camping adventures. I knew I wanted to use the Prima Say it in Pearls (sans flowers) on this layout and I love the way it highlights one of the beautiful, Prima Canvas Buttons. 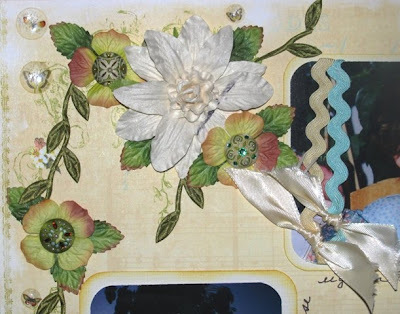 I used the two other canvas buttons as centers for the prima flowers, added some ribbon and two Prima Temple Leaves on the right side of the printed photo mats. 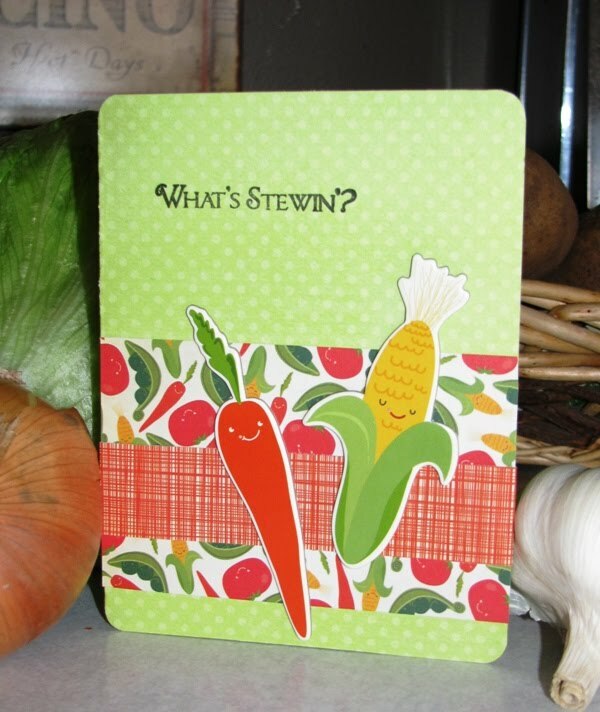 I love the journaling mat printed on this page. Just the perfect size for a nice memory! To finish of this layout, I welded the title on my Gypsy using the Gypsy font cut at 2 inches. Inking it finished it off perfectly! I just loved this Kit! 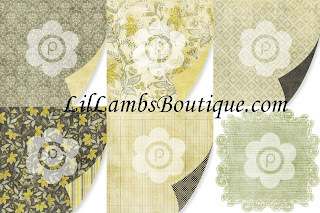 It appears to be Prima week here again at Lil' Lambs Boutique. Clearly we ladies on the Design Team having been having an absolute ball with all the gorgeous Prima Deluxe Kits that are in the Shoppe. 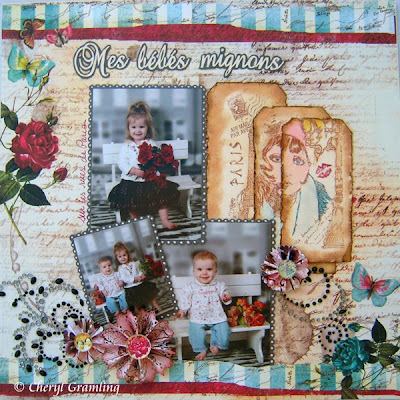 Below is a layout using the Pastiche Deluxe Kit, which I cannot tell you how gorgeous these papers are. I definitely will have a couple more layouts using this kit for you all to see. Meanwhile, it's off to Paris with mes bebes mignons (my cute babies). I held on to these studio pictures I had done of them several years ago, just waiting for the right paper collection to come along. Well, here it is. 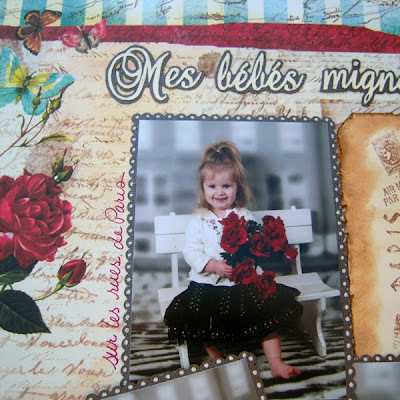 All the gorgeous items on this layout (except for the Paris collage stamp) came from the kit. Honestly, these papers are so stunning, there is not much left you really need to add...unless you're a froo-frooy scrapper like me. 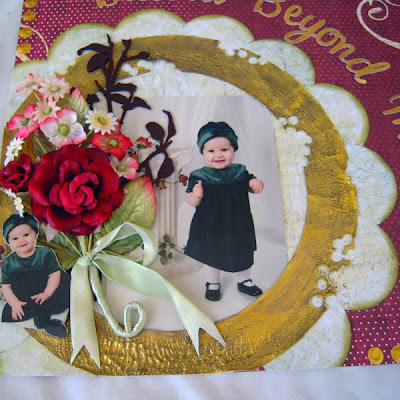 You'd really only need to add a few matted photos and a title and the gorgeous flower/butterfly borders will do the rest of the work for you. However, if you're like me, then throw some more on, I say. While the Pearls/Crystal bling and Prima Pebbles and additional handmade flowers can be quite busy, they don't seem to clash (at least to me) with everything else going on in the layout. To keep the flow of the bottom border of the paper, I cut a small slit with an exacto knife and inserted my matted photo inside. 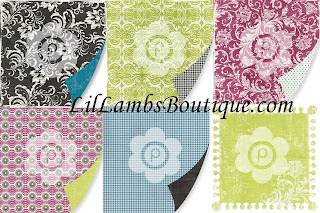 You simply must check out all the exquisite Prima items the Shoppe is carrying right now. I know people have been altering clip boards for ages, but this was my first! I loved it! But, PLEASE, can someone tell me...do you take the clip off before you cover it...then re-attach somehow?? I had to work around the clip, and that was not fun. But look at the Prima goodness...just soak it all in!